Considering that the SLAAC address is generated based on the prefix information option (PIO) contained in router advertisements one might be tempted to conclude: “if possible configuration-wise, why not remove that bit of information from the router advertisements?”. (we think:) Unfortunately some sources suggest exactly that. Now, can Alice communicate with Bob? Hooray! There’s only one (“managed”) global IPv6 address left and the hosts can communicate with each other, by means of it. We have achieved what we wanted (“DHCPv4 like network model”), right? 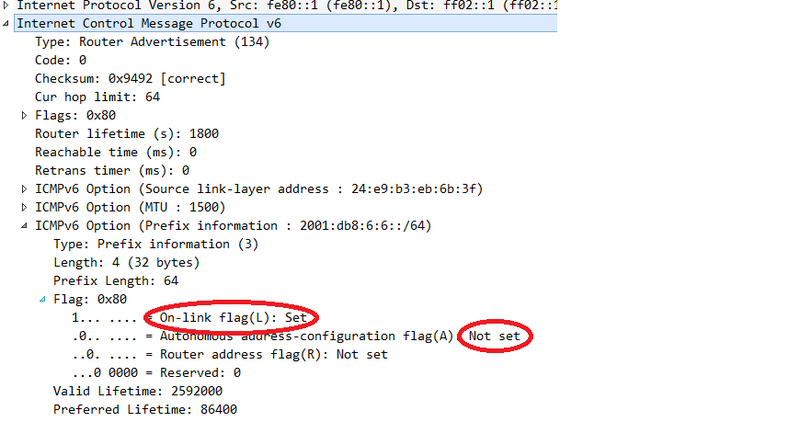 – Alice sends first ping to the router (given DHCPv6 prefix is not considered “on-link). – the router gracefully informs her that, from its understanding of the topology, this is not the optimal path. this notification happens by means of an ICMP redirect (type 137). – some mutual neighbor solicitations are performed. – based on the information learned from the ICMP redirect, Alice and Bob communicate in a direct manner (at least as long as “the redirected routing information is considered valid”). Now, you might reply: “what’s the big deal about this? I don’t care what happens in the background, as long as it works…”. Turns out that just clearing the prefix information from the router advertisements did not produce the desired result which still is “we just want the DHCPv6 network to have the same properties/behavior to what we did before with DHCPv4”. Fortunately there’s another tweak that can be performed. Looking carefully at RFC 4861 Neighbor Discovery for IP version 6 (IPv6) we realize that the actual generation of a SLAAC address is only performed once the “autonomous address configuration” (in short: “A-flag”) is set, within the prefix information option (PIO). If we can send router advertisements including PIO with the A-flag cleared, but the on-link flag left intact, we might be able to trick the receiving node into acting like this: “well, the router just informed me there’s a local prefix. I’m not supposed to use this info for generating an address but I still learned that this prefix [which co-incidentally is the same as the DHCPv6 prefix…] is on-link, that is a network with neighbors”. [for the moment I leave it up to the reader to figure the details of the above approach from the command reference]. – DHCPv6 is very different from DHCPv4 (which can be applied to the relationship between IPv6 and IPv4, too ;-)). There might be a third part of this series discussing pros & cons of DHCPv6 flavors in different enterprise settings. In any case I will give a talk on “Operating DHCPv6 in a Secure & Reliable Way” at the Troopers 2015 IPv6 Security Summit. Nice series. One other thing that may be worth explicitly pointing out is that DHCPv6 does not supply the default gateway (versus DHCPv4). So the local router and DHCPv6 server must work in tandem (and be coordinated!). The other gotcha I know you’ve run into is DHCPv6 using the DUID versus MAC and all the fun this brings – especially if you want to log the MAC address! Also, DHCPv6 introduces a server reconfigure option where it can tell clients to immediately make changes. However this requires authentication and I don’t believe either option is currently supported in any popular solutions. thanks for the feedback. Yes, DHCPv6 not being able to supply the default route is another major difference (causing quite some annoyance in enterprise space). As for the DUID vs. MAC thing: at least in relay scenarios this is meant to be addressed in the future by RFC 6939. Once all involved components support it (to the best of my knowledge, currently only ISC DHCP v4.x does) this should be solved. Furthermore agreed as for the (non-) support of DHCP auth (as of RFC 1918) by pretty much all solutions. Regarding the lack of routing information in DHCPv6, there was a draft RFC (https://tools.ietf.org/html/draft-ietf-mif-dhcpv6-route-option-05), which has expired currently. Do you have any info regarding the reasons for not having been adopted, or regarding its future? draft-ietf-mif-dhcpv6-route-option expired 18 months ago and to the best of my knowledge there hasn’t been a “successor” or similar effort since then, in none of the IETF working groups. It was probably the last of a series of fruitless attempts to bring a route option within DHCPv6 to life, so that ship seems to have sailed. That topic has been one of the most religious fights in the IPv6 world (which is full of such fights anyway). The main reason for non-adoption is, from my perspective, that the majority of the IETF community (mainly consisting of vendors and carrier people, so “main DHCP users = enterprise space” is strongly under-represented) considered RAs as sufficient (in particular given standards track RFC 6106) and did not recognize a need for “enhancing DHCPv6”. That’s my impression, I do _not_ take a position here.